18 Partituras para guitarra (nivel avanzado) de los temas contenidos en los discos “Roendopinho” y “Canção da impermanência”. 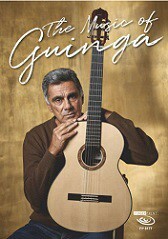 "Brazilian guitarist Guinga is considered one of the most important representatives of the music of his homeland. His CV looks like a Who’s Who of South American music history. A native of Rio de Janeiro, Guinga (Carlos Althier de Souza Lemos Escobar) is one of the most acclaimed Brazilian guitarists of our time. Born in 1950, he is recognized as both a player and a composer. As such, not only did he spent many years accompanying well-known Brazilian artists, but his songs – many of which are collaborations with famous Brazilian poets and composers – have also been recorded by countless Brazilian and Portuguese musicians. Guinga’s songs have been part of the curriculum in universities and music schools around the world, including the renowned Berklee College of Music (Boston, USA). Revered by critics, Guinga has been called the greatest and most important Brazilian composer of our times. In 2012 album Rasgando Seda was nominated for a Latin Grammy as Best Instrumental Album of the Year. In 2015, his song “Sedutora” won the Best Song category of the Prêmio da Música Brasileira awards, in which his “Porto de Madama” also won the Arranger category in 2016."